KTC jointly with Bangkok Airways, celebrate their 13th partnership anniversary and Bangkok Airways' 50th anniversary, transforming seven KTC – Bangkok Airways credit cards, covering all card alliance networks including MasterCard, VISA and JCB. Allowing members to choose as they desire with special privileges that cater to and suit the lifestyles of members, including the ability to fly faster by redemption of KTC FOREVER 1.5 points into 1 FlyerBonus points, up to 4x KTC FOREVER points, up to four usages of Blue Ribbon Club Lounge and free 10kg baggage allowance. KTC estimates a boost of 30,000 new members. Mrs. Pittaya Vorapanyasakul, Executive Vice President - Credit Card Business, "KTC" or Krungthai Card Public Company Limited, states, "KTC has collaborated with Bangkok Airways, the Asia's boutique airline, for over 13 years starting from 2005. 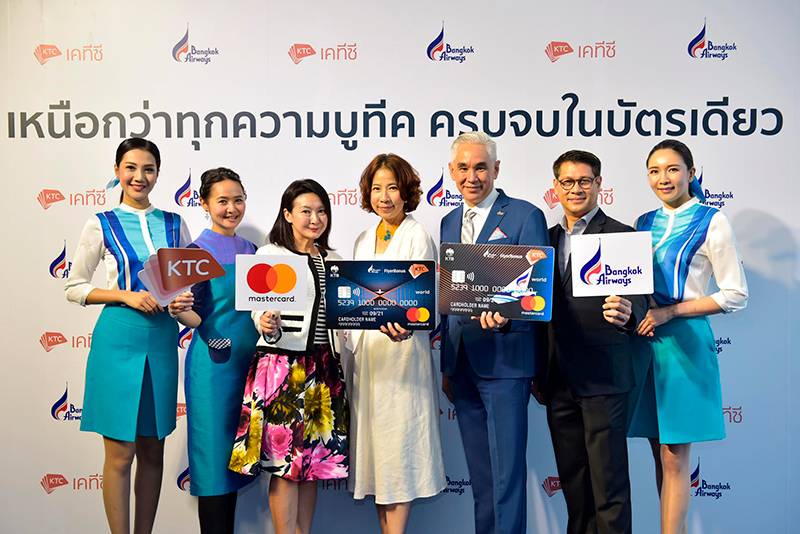 The collaboration set about from the launch of two joint credit cards, "KTC-BANGKOK AIRWAYS Titanium MasterCard" and "KTC-BANGKOK AIRWAYS VISA Platinum" with over 42,000 members. In the auspicious occasion of this 13th partnership anniversary and Bangkok Airway's 50th anniversary, we jointly revamp the appearance of up to seven KTC – Bangkok Airways credit cards, changing its design to be filled with the "boutique" elements, to cover all network alliances including MasterCard, VISA and JCB and to select special privileges with emphasis on demands that suit members' various lifestyles. Over 30,000 members are expected in 2019." "We added seven new credit card designs, including 1) KTC X – BANGKOK AIRWAYS World Rewards MasterCard; 2) KTC X - BANGKOK AIRWAYS VISA Signature; 3) KTC - BANGKOK AIRWAYS World Rewards MasterCard 4) KTC – BANGKOK AIRWAYS VISA Signature; 5) KTC – BANGKOK AIRWAYS VISA Platinum; 6) KTC – BANGKOK AIRWAYS Platinum MasterCard and 7) KTC – BANGKOK AIRWAYS JCB Platinum." "New KTC- BANGKOK AIRWAYS members receive more special privileges beyond boutique. This includes 1) up to 4x KTC FOREVER points for making transactions through Bangkok Airways' channels or purchases of Bangkok Airways flight tickets through KTC World Travel Service; 2) fly faster with the redemption of KTC FOREVER points for 1.5:1 Flyer Bonus points; 3) up to four usages of Blue Ribbon Club Lounge when flying with Bangkok Airways and 4) free additional 10kg baggage allowance. Including more privileges from partners such as receive 10 percent discount off A la carte WELLNESS treatments and PANPURI products, receive the TurboBright program free of charge and up to Bt. 50,000 discount from THE KLINIQUE, up to Bt. 5,000 discount e-vouchers from iFREE and receive Bt. 1,000 discount vouchers from Silverline Limousine. Special!! KTC - BANGKOK AIRWAYS MasterCard members receive 10 percent cash back for flight ticket bookings through www.bangkokair.com"
Mr. Prote Setsuwan, Vice President - Marketing, Bangkok Airways Public Company Limited, states "In the celebration of Bangkok Airways' 50th anniversary and its partnership with KTC for over 13 years, we are delighted to jointly develop and launch the newly revamped KTC - BANGKOK AIRWAYS credit card to cater to the needs of Bangkok Airways passengers', Flyer Bonus members' and KTC credit card members' lifestyles to expedite their travel time with more comfortability such as priority waiting list and priority lane check-in at Blue Ribbon check-in counter. Moreover, members can collect points for air award redemption tickets and other special privileges from our alliances in a faster manner." "We also have special promotions, including additional 1,000 FlyerBonus points, by making transactions for Bangkok Airways services or KTC World Travel Service for Bangkok Airways, for members who register for the KTC - BANGKOK AIRWAYS credit card between November 21, 2018 - December 31, 2019 with usage within 90 days after card approval." Mrs. Pittaya adds, "KTC and Bangkok Airways sincerely hope that the revamp of KTC – BANGKOK AIRWAYS credit cards will better meet the needs of members lifestyles. We will continue to search for special privileges that are to members' likings, for members to constantly receive privileges and enjoy traveling boutique style with Bangkok Airways in the future."